The Civic Museum of the South Lagoon is the first lagoon Museum and it is situated in the ex Convent of San Francesco. The first building dates back to 1315 and the second to 1434, after its destruction happened during the war between Venetians and Genoeses (1378 -1381). In 1806 the Convent was deconsecrated and from this moment on it assumes different functions: in 1808 it becomes military store therefore divided in two floors, at the end of the First World War (1915 -1918) fruit and vegetable and finally in the last postwar period the complex becomes refuge for the evacuees. Up to few decades ago it was a garage of the local buses. 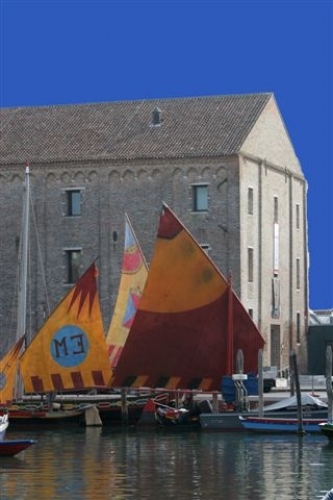 The Museum is made up of three floors and contains the most ancient archaeological finds discovered in Chioggia and in the neighbouring areas. The ground floor is dedicated to the pre-Roman and Roman archaeological period (between the First Century B.C. and the Forth Century A.D.), the first floor contains finds and collections of the Medieval, Renaissance and Modern Age, the second floor houses an exhibition of the local shipbuilding industry and navy from 1700 up to the present day.